You may think that you can escape the Illuminati with the help of Chris but can you trust him? Have you ever wondered why we attached a dolphin to your back using a very complicated and expensive surgical procedure? It's not an operation that you can have done by your pathetic NHS! Even if you could then the waiting lists for full body dolphin grafts would probably be ridiculous. The truth is that Chris may or may not work for us, but you'll never be sure. If you don't believe us then google 'CIA/Illuminati dolphin brainwashing and interrogation techniques', and you'll find that we have used aquatic creatures to get into the minds of our victims for thousands of years. HaaHHaaa! 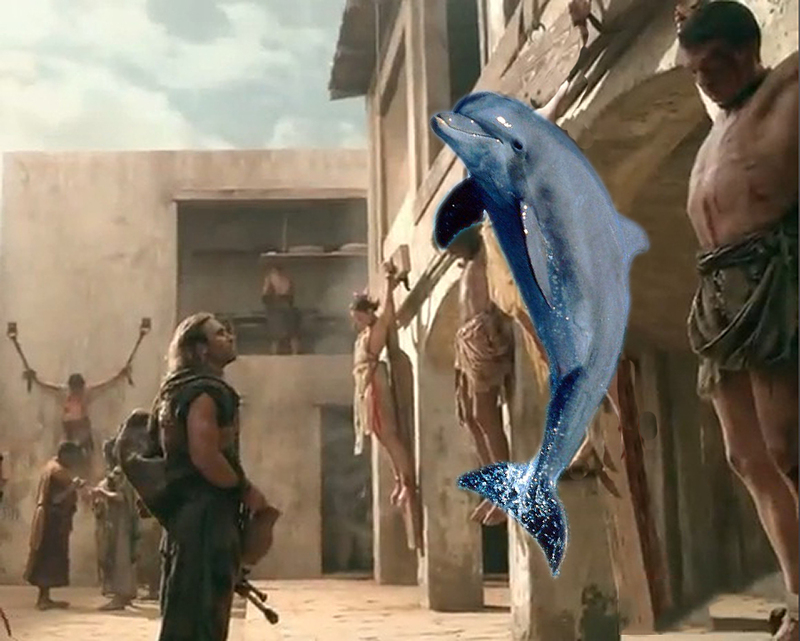 In fact, the first recorded use of a false flag dolphin graft was when Marcus Crassus used one on Spartacus, and we all know what happened to him. If you don't then the movie version is on Netflix - it's historically incorrect but you'll get the gist. Give it up Barry - turn yourself in and don't listen to Chris and his double/triple bluff about us using both of you to help us/them or you find the lost continent of Atlantis. We/you or all of us might not even be interested. Apologies for the dolphin crucifixion photo. Waste of time - went to Netflix and signed up for the trial so I could watch Spartacus. Spoiler Alert: there is no dolphin crucifixion scene or any cruelty to sea creatures at all. It's set mainly in the desert. I did enjoy the 'I'm Spartacus' bit but I was left unsatisfied as I was expecting so much more from this movie. 2 out of 5. Or is he Christ? I mean C H R I S on a C R O S S. Could be C H R I S T. Do you see where I'm coming from? Has Barry become Jesus His Mighty Lord, God of the Kingdom of the Sea, Land and Air like in the books that we was reading as little followers of the PATH to all things good and wholesome and the word will be made flesh like the blubber of the sea dolphin, master of this almightly sword? ?